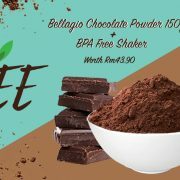 Signature Market is giving away FREE Handcrafted Bellagio Chocolate (150g) + BPA free shaker (worth RM 43.90). Simply sign up as a new member now to redeem these freebies. This giveaway is valid for new customers only. RM10 postage is applicable. Terms and conditions apply.